Bingham High’s back parking lot has only one exit point. It’s a punishing truth. If you want to get out of school there is only one way to do it, indignantly brave your way in that direction and pray that you don’t get killed by some junior on a joyride. Over the past year I’ve resigned myself to waiting around the school after school ends…you know, until the bloodbath dies down. Last week, I stepped out into the brisk November afternoon to find a novelty. 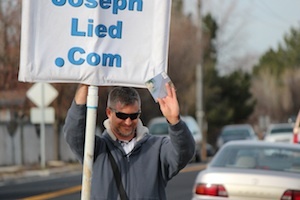 A man, who looks like he’s in his late 30’s standing by the exit, with a sign almost twice as tall as he was protesting the Mormon Church. Yeah, it’s a bit of a political topic, so I won’t touch on that. While I didn’t agree with him on religious views, I respected him for choosing such a great spot to flaunt his freedom of speech. 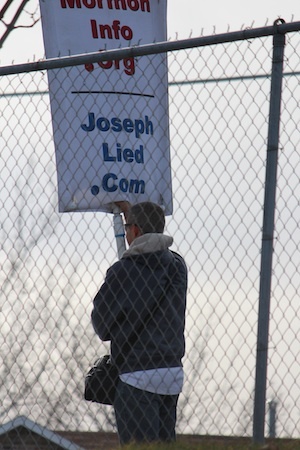 Last year, around this time of year, he was found standing outside the Seminary Building with the same sign. The relocation was a good move on his part. So, being the reporter that I am, what do I do when I see him? 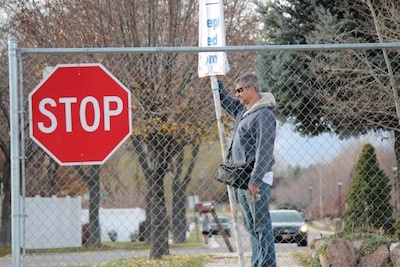 The Bingham Prospector has no bias on either side of this issue.